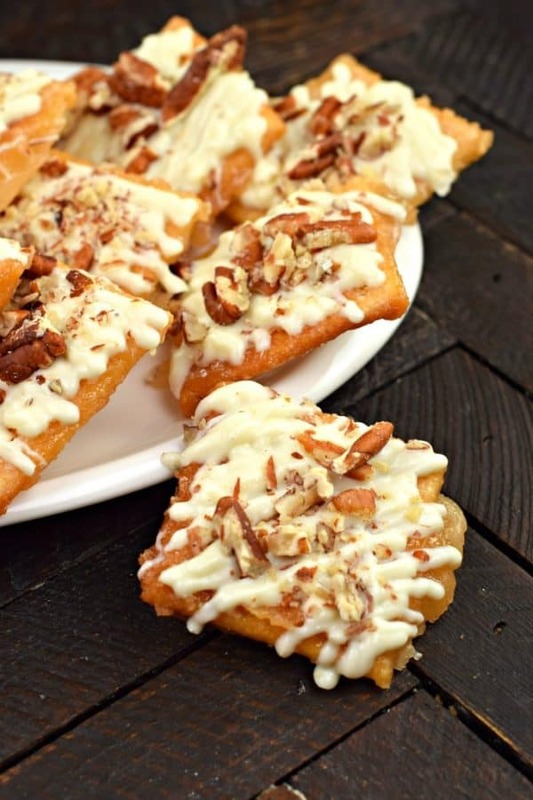 This crispy, buttery White Chocolate Pecan Toffee recipe is made with saltine crackers! Your family and friends will enjoy this holiday treat as much as you love surprising them! It’s that time of year again when I start cranking out the Christmas treats. If you’re new around here, be sure to click around in my archives and check out all my candy and holiday recipes! Today’s White Chocolate Pecan Toffee was inspired by our trip to Michigan this summer. We visited so many candy shops, and while YOU may go in to enjoy the treats, I go in for recipe inspiration. I mean, I’m only going to go to Mackinac Island once in my life, I need to recreate those delicious memories to enjoy all the time, haha! I have dozens of holiday cupcakes and cookies here on Shugary Sweets, but what you’ll find me giving as gifts this year is my homemade candy. 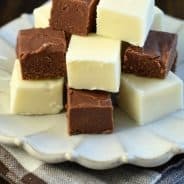 I have a ridiculous amount of fudge and toffee recipes to choose from. 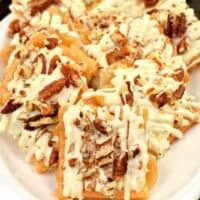 Not including all the new ones I come up with each year, like today’s White Chocolate Pecan Toffee recipe! Last year I made this Peppermint Toffee and I was smitten. I wasn’t sure I would love the peppermint candy with the buttery toffee…but I do. Plus it’s adorable to add to your cookie trays, and tastes better than Peppermint Crack! I’ve also made S’mores Toffee, Peanut Butter Toffee, Oreo Toffee, and Caramel Coconut Toffee. As you can see this ain’t my first toffee rodeo! 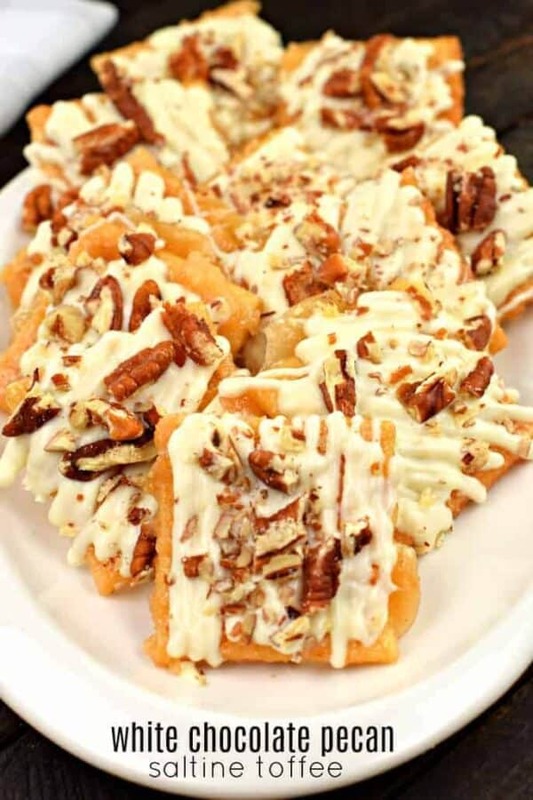 When I saw a White Chocolate Pecan Toffee in a candy shop in Michigan, I knew I found my next toffee recipe! And it doesn’t disappoint. It’s buttery and crunchy and wonderful. I think you’ll agree once you make it yourself! Line 35-40 saltine crackers on a 15 x 10 x 1-inch baking sheet. Do this first! 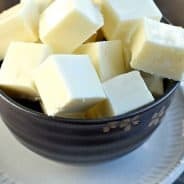 Melt your butter in a saucepan on medium heat, then add your sugar. Bring this mixture to a rolling boil. Pour mixture over crackers, slowly, making sure that all the crackers have been covered in butter! Bake this for about 13-15 minutes. You want to make sure that the crackers look brown and caramelized. I prefer to remove them immediately from the pan and let them cool on a piece of parchment paper. 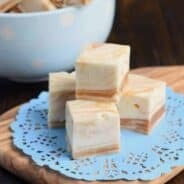 I like the perfect square toffee (as you can see with this traditional English Toffee recipe I make). Once you’ve placed all your toffee on the parchment paper, melt your white chocolate wafers (I love using the Ghirardelli brand because they melt so smooth and taste delicious). Place your melted white chocolate into a large ziploc bag, then snip off the corner and drizzle GENEROUSLY over each cracker. Sprinkle immediately with chopped pecans and allow to set (about 15-20 minutes). Store in airtight container at room temperature for up to 5 days. 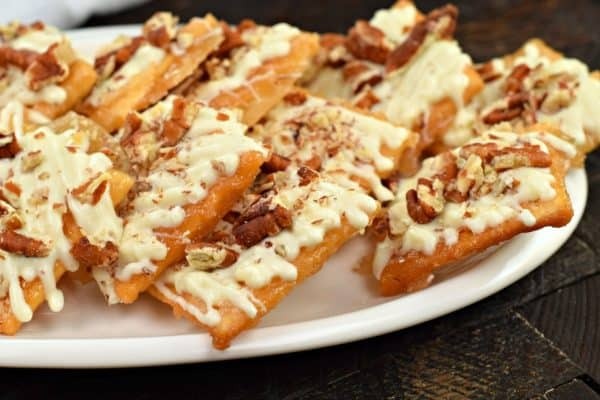 Melt white chocolate wafers and spread generously over toffee. Immediately sprinkle with chopped pecans. Allow chocolate to set and store in airtight container for up to 5 days. Looking for more holiday candy recipes? Christmas Cookie Bark from Inside BruCrew Life is incredibly easy…and delicious. The perfect last minute treat to make! Salted Nut Roll just like your remember from childhood. Add this to your dessert table this holiday! Old Fashioned Potato Candy from Southern Plate. I’ve never had this but the recipe sounds wonderful! Reindeer Cookie Bark from Your Homebased Mom. Even the kids can help make this one! This toffee looks irresistible! It’s perfect for sweet gifts for the holidays!